Shouwang Church, established by Pastor Jin Tianming in Beijing in 1993, has been the target of government persecution since May 2008, when the government began to “rectify society” before the Olympic Games. The next year, the church’s landlord gave into official pressure and evicted Shouwang Church. In 2009, the church held two outdoor services in Haidian Park on Nov. 1 and Nov. 8, after which authorities allowed the church to resume indoor activities. However, the reprieve didn’t last. Following the church’s Dec. 22 purchase of a 16,145-square foot floor of the Zhongguancun Daheng Technology Building in Beijing for 27 million Yuan (U.S. $4.3 million), authorities pressured the space’s seller to keep the keys to the meeting place from Shouwang Church without explanation. The church was in and out of venues between May 2010 and March 2011. 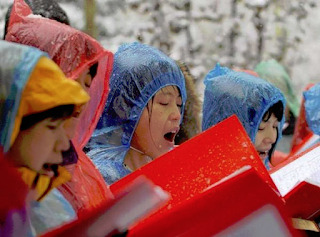 When their landlord at the time refused to renew their lease, the church resolved to hold outdoor worship services, beginning on April 10, 2011, in Beijing’s Haidian Park. Shouwang Church continued to meet in Haidian Park with hundreds of attendees—including government officers who routinely take a number of Christians into custody. Those who are detained during the church’s Sunday services are sometimes released after several hours but are more often placed under administrative detention for “disturbing public order,” with first-time detainees receiving a sentence of 5-7 days and repeat detainees receiving a 10-day sentence. Because of the constant pressure, Shouwang Church can no longer hold meetings in the park. In 2014 alone, approximately 100 church members were administratively detained, and more than 10 were beaten by police. Many of the church’s pastors have been under house arrest for years. The church applied for government permission to register as a Three-Self Patriotic Movement (TSPM) church in 2006 under the condition that the church retain some authority, specifically the authority to choose to continue to have God as the center of the church rather than the Communist Party of China, but the government denied the request. Many church members have faced the loss of their homes and jobs due to official pressure towards the Christians’ landlords and employers. We the undersigned, churches and individual Christians from all over the world, stand in solidarity with our fellow believers from Shouwang Church in Beijing and call on the Chinese government to end the religious persecution of this church and its members and to uphold the right to freedom of religion guaranteed by the Chinese constitution. During the past few weeks, the Christians of Shouwang Church have been deprived of a place of worship, whether indoors or outdoor. Many church members have been detained, interrogated and even physically abused; church leaders were placed under extra-judicial house arrest for weeks. Authorities even prevented the congregation from holding its service on Easter Sunday, the most important holiday of the Christian calendar. All these governmental actions are direct violations of the human rights clauses of the Constitution of the People’s Republic of China and also violate the Universal Declaration of Human Rights, to which the Chinese government itself is a signatory. Our appeal expresses the views of and is endorsed by churches and individual Christians from around the world. It is entirely without any political agenda and free from any government involvement. It is simply a voice of conscience, a call to respect human dignity and to recognize the inalienable rights accorded to every human being, particularly, in this case, to the leaders and members of Shouwang Church in Beijing. We acknowledge that China has made remarkable economic progress in the past three decades. The Chinese government deserves recognition for its policies which have improved the lives of hundreds of millions of poverty-stricken Chinese and raised the literacy level through compulsory education. In the area of social justice and human rights, however, China has failed to make commensurate progress. Economic growth without reforms in social justice and human rights could result in great harm for the Chinese people, and could have catastrophic consequences for Chinese society if left unaddressed. We as churches and individual Christians therefore appeal to the Chinese government to end its repressive political actions against Shouwang Church and it members. In so doing, it will demonstrate its respect for human rights and human dignity, social justice, and the Chinese constitution. Christian churches around the world are all One in the Body of Christ. As members of this Body, we stand in solidarity with, pray for and suffer with Shouwang Church. May the Lord’s blessing be on Shouwang Church and may He sustain her in this time of testing, grant her grace, wisdom and perseverance, and establish her like “a city on a hill” as described in the Bible to manifest the glory of our Lord. May God Bless You!